Any of my climbing and/or skiing partners over the past two years will attest that I’ve fairly injury-prone. I’ve suffered from one ailment or another for the past 12 months with a broken bone a couple years ago. However, it should be said that my lifestyle has changed completely since moving to Utah 2.5 years ago. Whereas in New York I’d be lucky to get outside to hike or something once every two months, some weeks I’m outside 3-4 times, with workouts every day in between. I’ve become somewhat of an exercise junkie: Pull-ups, push-ups, fingerboard workouts, front lever progressions, and most recently weighted ice tool dead-hangs. Pretty much every day I’m not actually climbing, I’m doing some other type of workout. Not to mention 20 miles of running a week back when I was training for the Steeplechase and The Other Half Marathon in Moab. While the broken collarbone was due to general jackassery, the latest injuries have been from overuse. Not wanting to plateau in my performance, I’m constantly mixing things up and pushing myself. I’ve had three finger injuries in the past year (putting me out of commission for maybe 3-4 months total), all from crimpy gym boulder problems. A couple of years ago I had tendonitis in my ankle and leg from running too far, too fast. In early October I injured my Iliotibial Band three weeks into an 18-mile-a-week training schedule off the couch (ugh…stupid). Thus, my main goal currently is recovery (well, second to climbing as much ice as possible). I’ve learned how to cope and am back to climbing in the gym twice a week with a much-improved finger. Gym bouldering is probably out of the picture for a long time, at least crimpy problems, as finger injuries are awful for a climber. I’m probably going to be suffering through the IT band injury for as long as there’s ice to climb this winter, but that’s ok. It’s all about priorities. Running is out of the picture for as long as necessary. After two years of climbing all over the Wasatch, I decided to put in a Saturday to contribute back to the community. 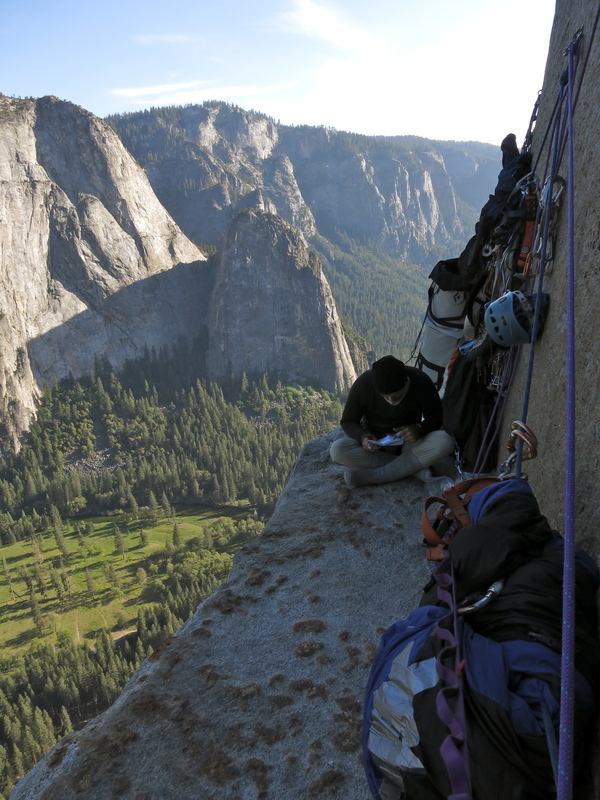 The second annual American Alpine Club’s Craggin’ Classic event was held in Salt Lake this year, featuring slideshows by local badass Brian Smoot and renowned alpinist Steve House. I spend an inordinate amount of time looking at routes on Mountain Project, and have come across (and climbed) dozens of Brian’s, so I was excited to match a face to the name. The slideshow was superb, looking back at 60 years of climbing in the Wasatch, in every area, in every medium. Seems like the dude has done it all, and is still incredibly humble. The main event though, of course, was the day of cragging in the canyons. 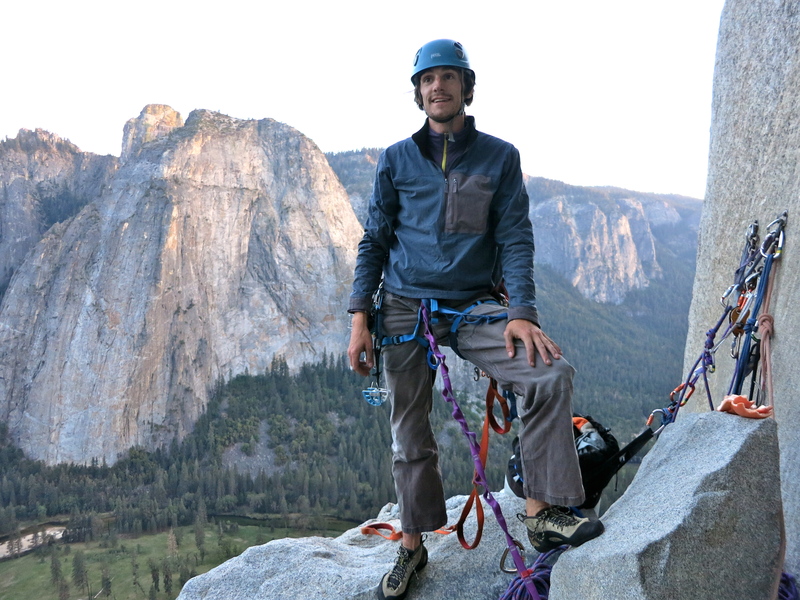 I had signed up for a clinic with a friend, and we happened to fall under the guidance of Cedar Wright, a professional climber known for his crack-climbing expertise. Nancy Feagin, another local under-the-radar badass climber, tagged along. Both guides were exceptionally helpful and modest the whole time, leading by example. We went to the Dihedrals area of Little Cottonwood and played around on some 5.9s and .10s. There I met Erik, a correspondent for Alpinist magazine on his way to moving to Boulder, who later posted this article about the event. It was pretty fun — I even took my first lead fall on my own gear later in the afternoon, just to scamper back up and finish off the climb without further mishap. Ever since I started climbing, I had heard of the otherworldly sandstone towers of Southeast Utah: hundreds of feet tall, solid rock, and amazing scenery. At last, I made the trip down to Moab to climb to climb the most famous one, Castleton. I must say I was quite intimidated at the parking lot. The tower looms in plain view, seemingly vertical and unclimbable. However, around the back side of the tower was a series of stepped dihedrals and chimneys that looked easier and less exposed. 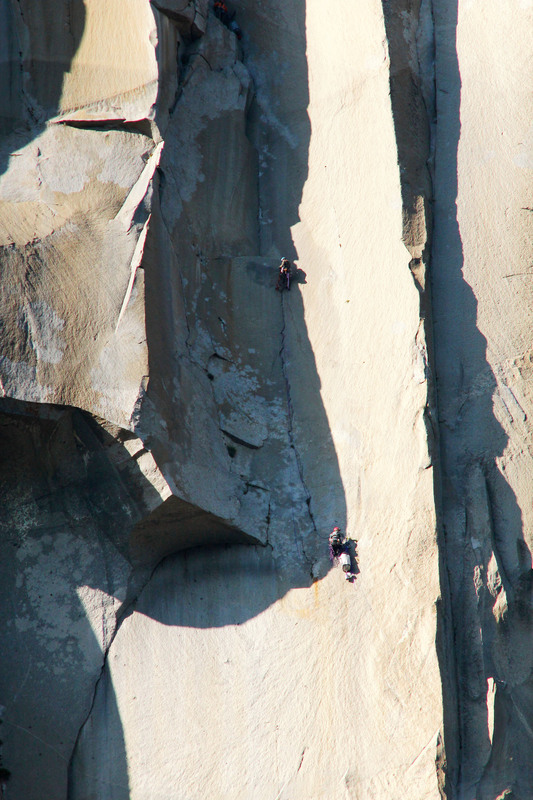 This is where the Kor-Ingalls (5.9+ III) route lies. As expected, we ran into several parties on the route, as early November is peak season for desert sandstone. 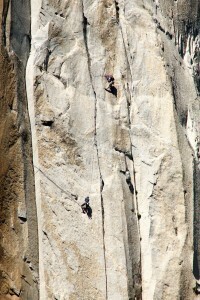 The climbing went pretty quickly, though, and Brian made sure to stick me with the crux third pitch. I needed a few minutes to compose myself before setting off on lead, shimmying up the first section before wedging myself in a chimney to get some gear in. 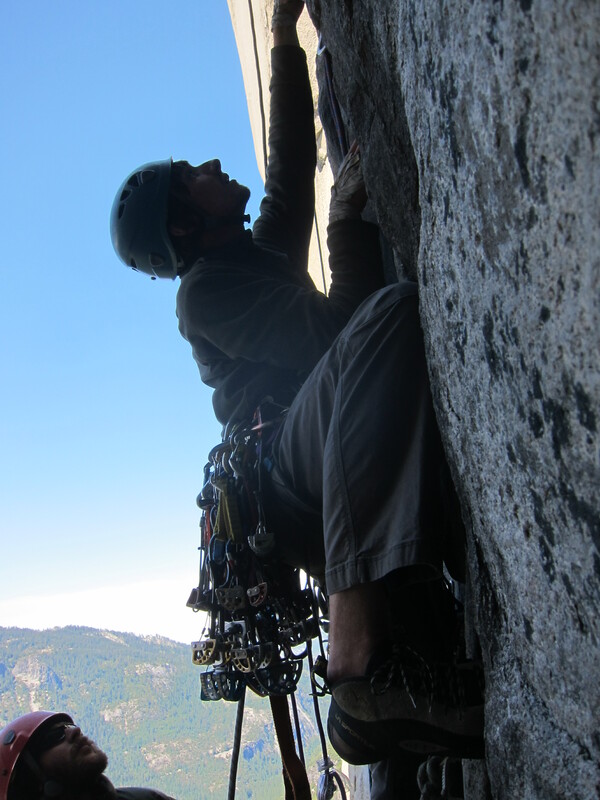 A large section of the crux pitch is unprotected, and only a very low bolt and two small cams protected the upper part, which I chose to stem. 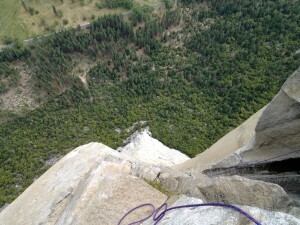 The stemming was technical but not too strenuous and I ran it out to the top, heart pounding. Exhilarating! Soon afterwards we were on the summit, about as wide as my house. After reading so many great things about Red Rock Conservation Area, near Las Vegas, NV, I decided I needed to see for myself. Luckily, Brian’s trip was postponed to a later weekend and I was able to tag along. Brenton unfortunately had to drop out so it was just the two of us. We took off early Friday morning and drove through a snowstorm for about four hours down to Cedar City. By the time we passed through Arizona it was sunny and warm again, and soon enough we were passing through the City of Sin. We secured a campground (barely) and made our way to Red Rocks. I was (am) nursing an injury to my IT band so I was hoping to limit the uphill hiking to keep the pain to a minimum. Thus, we chose to climb in First Creek Canyon the first day. We started on Black Magic, an excellent 5.8 on the Lotta Balls buttress. Brian led the first and third pitches, by far the best of the climb, while I gladly followed. For some reason my lead head was not in shape for the whole weekend, a shame since I ended up on the sharp end for eight or nine pitches! I can only chalk it up to not being familiar with sandstone, especially the textured sandstone of Red Rock. Breaking off a pebble on my first lead of the trip probably didn’t help, either.. 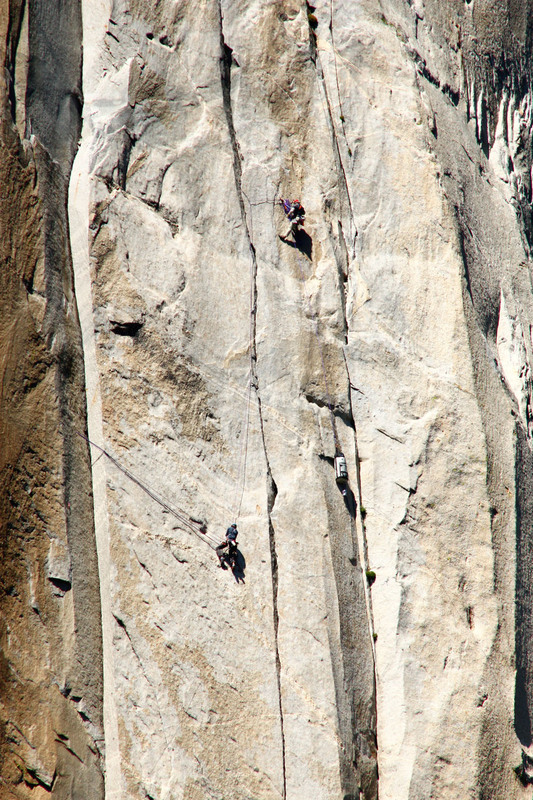 The second day we got up at five to beat the crowds to Crimson Chrysalis, a nine-pitch 5.8+ in Juniper Canyon. The approach was arduous, and I was feeling the pain in my knee about an hour into the hike. By 8:30 we were climbing, psyched to be the first party on the route. The climbing was steep, continuous, and surprisingly moderate. 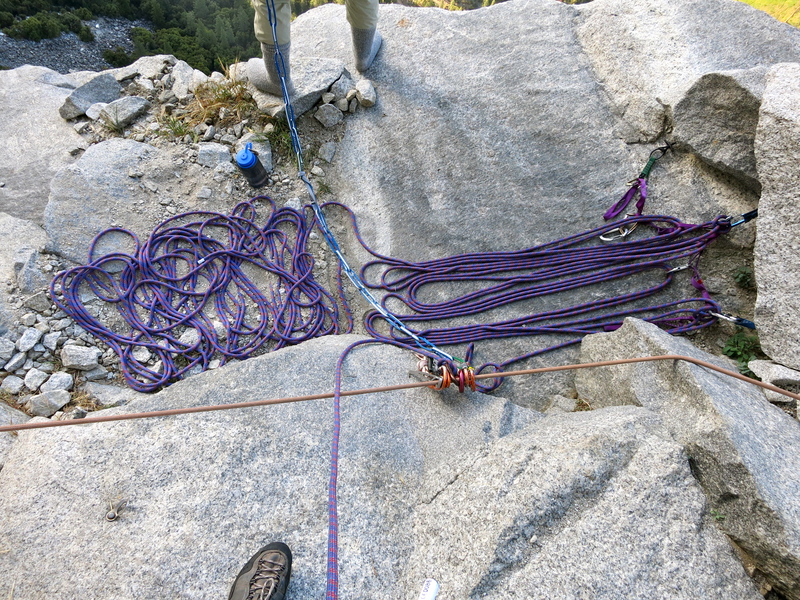 I again had to psych myself up for the lead, even though it was only 5.8, and terrifyingly made my up to the next anchors. 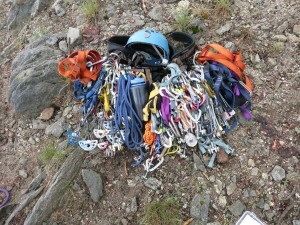 About half of the belays were hanging, a rarity on a 5.8! 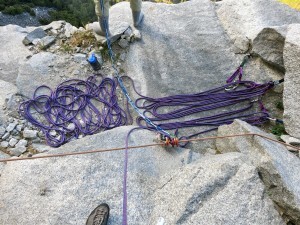 Brian and I swapped leads for the rest of the day, clipping bolts and face climbing. I didn’t need to do more than a dozen or so jams the entire route — gotta love Red Rock! Around 1-2 we topped out on a glorious summit with magnificent views of the valley and Rainbow Wall, towering over us to the west. I’d say it was the best route I’ve ever climbed, and we didn’t see a soul all day on it! 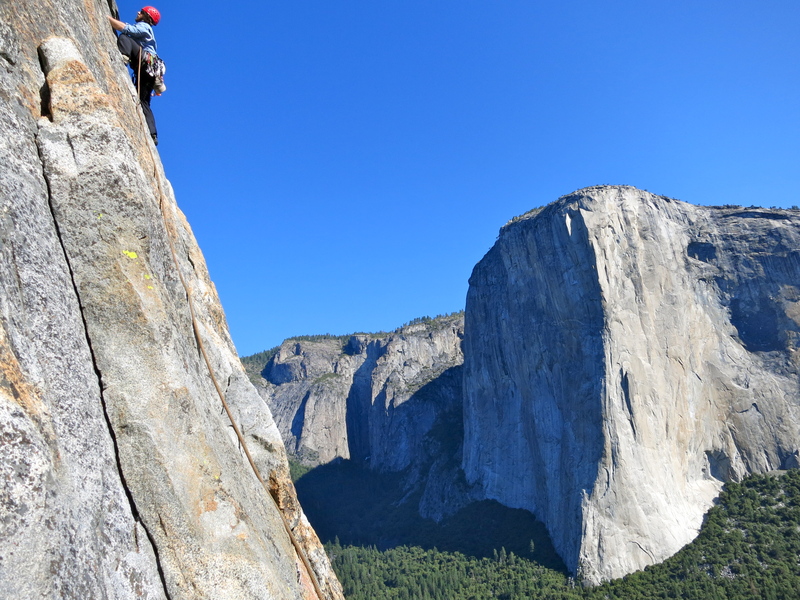 The rest of the trip was pretty anti-climatic, we returned to Lotta Balls buttress the next day for another classic four pitches before making the long drive back to Salt Lake. I’ll be back this Spring!